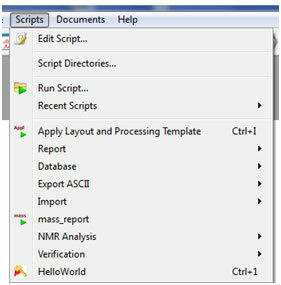 You are at:Home»Resource by product»Scripting»Where should the scripts be saved? Where should the scripts be saved? 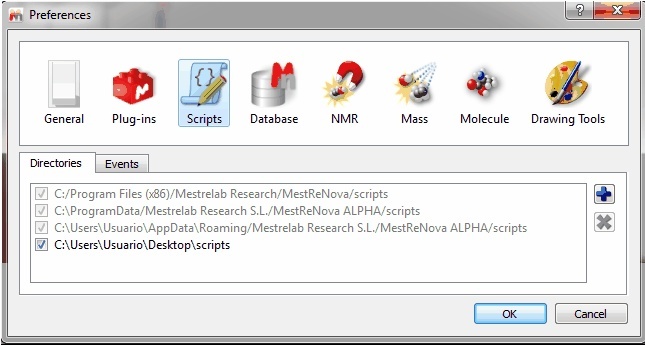 This line is used to instruct Mnova about the name to be displayed in the scripts menu along with the keyboard shortcut and the text used as a tooltip. Please bear in mind that you can also use any created image file as icon. In this case, the name of the script is HelloWorld, the shortcut is Ctrl+1, the tooltip is Hello Worls and the icon used was saved at C:/bin2.jpg. Please bear in mind that the script file will need to have the same name that the function which you want to call, in this case the name of the script must be ‘HelloWorld.qs’, because the name of the function is: HelloWorld ().